Welcome to the Fit Small Business QuickBooks Online training course! In this lesson, we’re going to cover how to set up vendors in QuickBooks Online. We’ll explain how to manually add customers and how to upload vendor data from an Excel or CSV file. You can follow along on your own QuickBooks Online account. If you don’t have one already, click here to sign up for a free, 30-day trial and follow along below. If you’d like to learn more about managing income, expenses and reporting in QuickBooks download our free, 39-course QuickBooks tutorial here. If paying bills in QuickBooks, you want to set up your vendors. 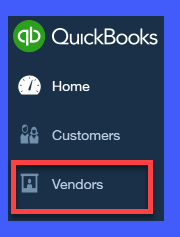 Setting up vendors in QuickBooks ahead of time will save time later on, when you need to enter a bill, because you will be able to select vendors from a drop-down menu and most of the fields will automatically populate the forms for you. Expedite Bill Processing: Quickly enter vendor bills with information like remit to address and due date automatically pre-populated from the vendor profile. Track expenses by vendor: This will allow you to run reports that will provide insight into which vendors you are spending the most money with and what items you are purchasing from them. First, we’ll explain how to manually set up vendors in QuickBooks. However, if you have more than 10 vendors to set up in QuickBooks, I recommend that you proceed to the next section of this lesson, How to Set Up Vendors using an Excel or CSV file. If you have fewer than 10 vendors, you can easily set up vendors in QuickBooks manually. Navigate to the Vendor Center and select New Vendor. Enter the contact information for the vendor and save it. If you have 10 or more vendors, head over to the how to set up vendors using Excel section of this article. To set up a new vendor, you need to enter basic contact information such as a contact person, the business name, and remit to address. The email address of your contact, along with the payment terms and the federal tax id number, are also pertinent details to include. First and Last Name – Complete this for individual vendors; this information will appear on all bills and purchase orders that you create. Display name as – This field will auto-populate based on the information entered in the Vendor Name field. This is how your vendor will show up on your Vendor list in QuickBooks. Print on check as – When you write checks and pay vendor bills, the payee information will come from here. If the payee is different from the vendor name, then you can make the necessary changes here. Address – This should be the address where you need to mail your payment to the vendor (i.e., remit to address). Notes – Enter any additional information here that you would like to keep track of for your vendors (e.g., additional contact names or phone numbers). This information is for internal purposes and will not be visible to your vendors. Email – The email address that is entered here will be used to send vendors purchase orders via email. Phone/Mobile/Fax – Enter the contact telephone numbers provided by your vendors. Website – Enter your supplier’s website address for quick reference. Payment terms – In the How to Setup Expenses lesson, we set up default payment terms (e.g., net 30) for all vendors. If you want to change the default payment terms for any vendor, you can do so here in the vendor profile. Business ID No. – You need to request the tax ID or Social Security number from all suppliers since that is a key piece of information you will need for the 1099 tax form. When preparing 1099 forms, QuickBooks will take the tax ID information from here. A WORD OF CAUTION: If you do not have the tax ID for a vendor, you will not be able to print a 1099 form. Track Payments for 1099 – By marking this box, QuickBooks will track these vendors and include them on a 1099 report. If the supplier is not incorporated, you are required to send them a 1099 tax form if you pay them $600 or more in a calendar year. TIP: Before you issue the first payment to a 1099 vendor, ask them to supply you with a completed W9 form. This form will have all of the key information that you need in order to create a 1099 form. 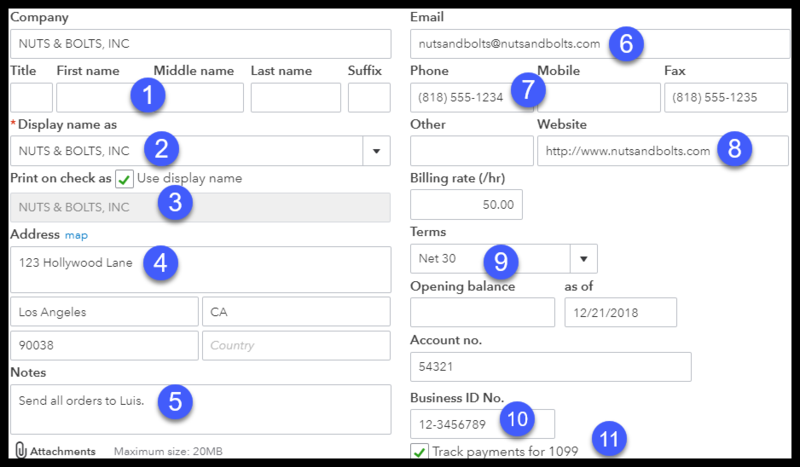 In addition to contact details, you can attach files, set billing rates, establish opening vendor balances, and assign account numbers to vendor suppliers in QuickBooks. Attachments – Attach any documents that you would like to keep on file for this vendor (e.g., signed contracts or copy of email correspondence). Billing rate (per hour) – Enter the hourly or flat billing rate for this vendor for easy reference. Opening balance – This field can be used to enter an outstanding balance that you have with a vendor. For example, if you are converting from another bookkeeping system to QuickBooks and you have some outstanding bills, then you can enter the total outstanding balance here when you set them up in QuickBooks. Account Number – If you have an account number with your vendor, you can enter it here for easy reference. Now that you have completed the vendor setup, the vendor will appear in the Vendor Center as indicated below. You can review the information to ensure it’s correct. If you need to make any changes, simply click on the vendor’s name and make the necessary edits. Setting up your vendor profiles in QuickBooks Online allows you to quickly enter vendor bills since all of your information, like remit to address and due date, will automatically populate from the vendor profile. If you have more than 10 vendors to set up, I would recommend that you put the information in an Excel document and import the data into QuickBooks Online. If you have more than 10 vendors, you should import vendor information using an Excel or CSV file. Once you have your data in a spreadsheet, navigate to the Vendor Center and click on the arrow to the right of New Vendor. Select Import vendors and follow the on-screen instructions to import your vendors into QuickBooks. Don’t worry about the format of the spreadsheet—just make sure that you have the above key fields in the spreadsheet. To import into QuickBooks, navigate to the Vendor Center. Click the drop-down arrow to the right of the blue New vendor button and select Import Vendors, as shown below. Click the Browse button to locate your Excel file and select the file you would like to upload. Click on the Next button located at the bottom of the screen to proceed to the next step. TIP: If you want to see a sample Excel file, just click the Download link as indicated above. Keep in mind that there is no need to reformat your spreadsheet. In the next step, we are going to map the data so that QuickBooks will pull the right data from your spreadsheet. In this screen, we will tell QuickBooks which field in our spreadsheet to pull the vendor information from. By doing this, we will ensure that the information is imported into the right fields in QuickBooks. Below the Your Field column, select the column in your spreadsheet that corresponds to the QuickBooks Field. QuickBooks Field – This is the field in QuickBooks where the data will import. 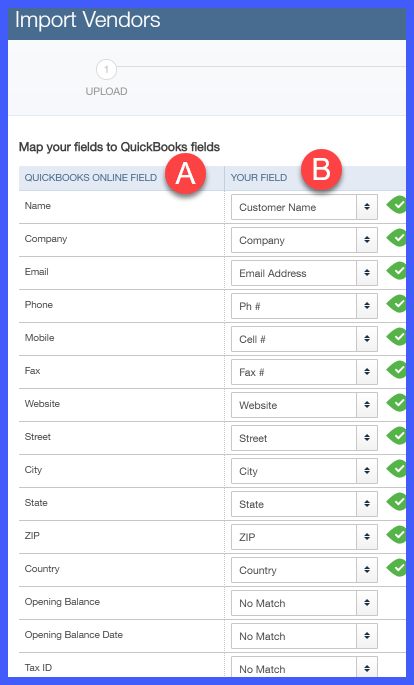 Your Field – From the drop-down, select the field in your spreadsheet that matches the QuickBooks field (i.e., the field where the information should import to). Once you have completed mapping your data, go to the next screen. TIP #1: As you can see in the screenshot above, the fields in your spreadsheet do not have to match the field names in QuickBooks. For example, in QuickBooks, the Customer field is Customer Name in the spreadsheet. TIP #2: Don’t worry about having more fields in your spreadsheet than what you see in QuickBooks. The only data that will import into QuickBooks are the fields that you match to the QuickBooks fields. You can indicate No Match for the fields that you do not wish to import into QuickBooks, as indicated above for the last three fields (Opening Balance, Opening Balance Date, and Tax ID). If something is not right, click the Back button to go back and make any necessary changes. Select Import once you are ready to proceed. Once the import is complete, QuickBooks will provide you with a message like the following: 10 out of 10 vendors have been successfully imported! You can change or update vendor information anytime. From the Vendor Center, click on the vendor’s name as indicated below and make any necessary changes to the vendor profile. Similar to customers, you cannot delete a vendor once you have used them in a transaction. For example, once you have created a check to pay a vendor, it is considered a transaction. However, if you decide that you no longer will do business with a vendor, you can inactivate them, which will hide the vendor from the list but will keep all previously recorded transactions. 1. Navigate to the Vendor Center and select the vendor, as indicated below. 2. Select the Edit button at the top of the next screen, as indicated below. A WORD OF CAUTION: If you have an outstanding balance for a vendor, QuickBooks will display a message similar to the one below. The best course of action in this situation is to pay the outstanding balance first and then inactivate the vendor. If you do not plan to pay the outstanding balance, then you should void the bills in QuickBooks and then proceed to inactivate the vendor. That wraps up the lesson on how to set up vendors in QuickBooks Online. The next module in our QuickBooks Online Training Course will be Managing Sales and Income in QuickBooks Online. In this module, we’ll cover sending and receiving payments, estimates, and invoices, as well as record deposits in QuickBooks Online. If you’d like to learn more about managing income, expenses, and reporting in QuickBooks, download our free, 39-course QuickBooks tutorial here.